Choosing the right chandelier for your space is important as this piece has the ability to tie a room together and create a cohesive, finished look. The right lighting can enhance the ambiance of your room and welcome guests to further explore the space. When choosing a chandelier, it is important to keep a couple things in mind. Consider the size and shape of other pieces in the room. If there is a fabulous, bold round table in the room it may be wise to choose a chandelier with similar round features. Color is another thing to consider when buying lighting. 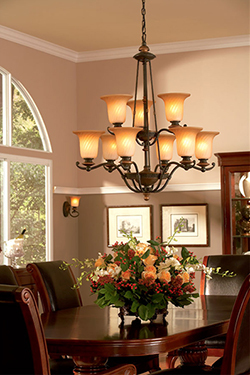 As a focal point of the room you can choose a chandelier with a punch of color to match other accessories in the room. Finally, consider the “wow” factor when choosing this important piece. If you have a beautiful space and need to add that extra va-voom to take it to the next level, then consider a chandelier with unique features that you could never find at a big-box store. For more tips and advice visit one of Hortons Home Lighting three exquisite showrooms in the Chicago land area. Set up an appointment to meet with one of their personal lighting concierges.